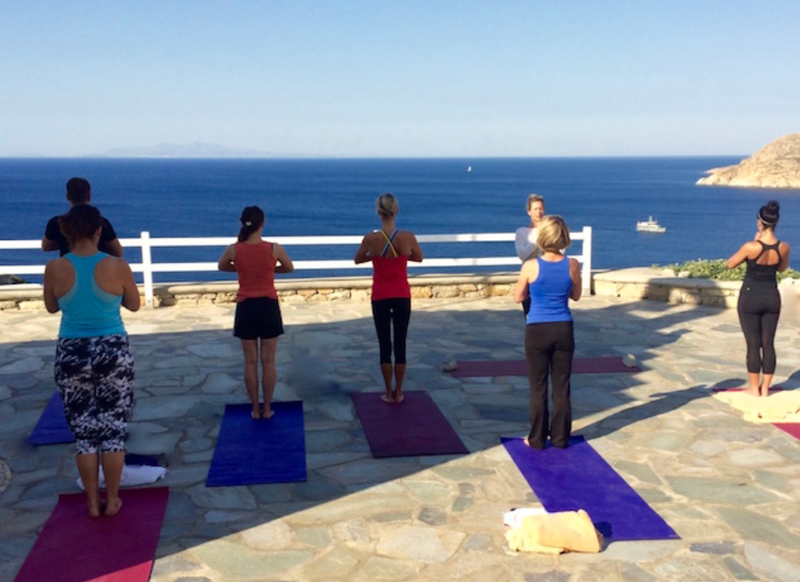 Ready, Set, Slow: Lipsi, Greece, September 9-16, 2018. Turn the switch in your head to "off" and explore presence, mindfulness and luxury on one of the most beautiful and unspoiled islands in Greece. The yoga begins when your journey begins. There is no fast and easy way to get to Lipsi, a hidden gem in a string of islands in the Aegean Sea. That’s the point of this week. To slow down, to embrace the journey as much as the destination, and to fully appreciate every action you take in furtherance of your goals. To give up the illusion of control. And to embrace each moment--on the mat, in the sea, and even in transit. When it’s over, you’ll understand more fully why the best places are not always the most accessible—both inside yourself and out in the real world. Two daily practices--gentle flow in the morning and a more restorative practice in the evening--will help you connect to your body while stilling the myriad voices inside your brain. I want to come but can't do yoga. Help! A private boat will take you directly from the tiny Leros airport to your home for the week--Villa M. Known locally as "the villa with the pool, " this compound built into the side of a hill has seven bedrooms, all with private bathrooms and queen sized beds, its own beach and pier, and a fully equipped kitchen where you will take all of your meals before dinner. Use it as your staging area for exploring the island or stay put and practice slowing down. Lipsi, the legendary island where Odysseus dallied with the sea nymph Calypso for five years before returning home to his wife, remains just as seductive today. Those who are willing to make the journey are rewarded with serene beaches, spectacular scenery, and an utter lack of traditional tourism or development, where locals and visitors mingle together in tavernas as the sun sets. It's the way Greece is meant to be experienced--far from the cruise ships, restaurant touts, and all-inclusive resorts. 12:00--free time. Hike, swim, explore, nap--whatever you like. It's YOUR vacation! Unlimited use of the villa's facilities and amenities, including canoes, sea kayaks, paddleboards, bicycles, and WIFI. Yoga mats and beach towels--please bring your own from home. Price per package: $1,891 single occupancy or $2,491 double occupancy ($1,245.50 per person). 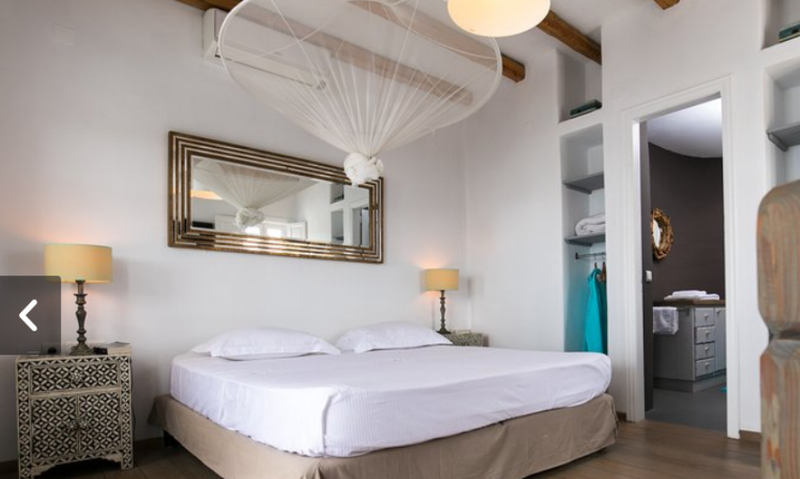 Because the beds in Villa M must be shared, we do not have single spots in double rooms available. Click here to secure your space with a deposit of $600. It is possible to stay elsewhere on Lipsi and still participate in the retreat if Villa M is full. Retreat-only packages are $600 per person for the duration of the retreat and include everything but accommodations and transfers. These packages are limited and dependent on occupancy of Villa M.
How do I get to Lipsi, and how long will it take? Please scroll down to find details about making your travel arrangements. It is not a short trip, but once you have all of the moving parts in place (arriving in Greece in time to catch the 3:00 flight to Leros), it is simple and stress-free. The flight from North America to Athens lasts between eight to ten hours, and the flight to Leros is a short sixty mintues. If I leave Chicago at noon on a Saturday (my preferred flight, on American Airlines, connects through Philadelphia and gets me into Athens by the next morning), I can be on Lipsi in time for dinner on Sunday evening. You'll gain the day you lost on the way back. Pack like you would for any beach vacation. September in the Dodecanese is still warm without the oppressive heat and high winds of July and August. Bring a few bathing suits, a cover up, lots of sunscreen, a hat and sunglasses (the sun is strong!). An insulated water bottle will be your best friend if you're planning on hiking, as will a sturdy pair of running shoes or light hiking boots. Many of Lipsi’s beaches are rocky, and having a pair of rubber soled water shoes with traction that you can wear into the water will make it easier and more fun to swim. If you enjoy snorkeling, bring along a mask and snorkel. There’s always something to see underneath the clear blue water. Fins are optional, because they are heavy and take up a lot of room, and you won’t need to swim very far unless you want to. Do consider bringing a notebook for journaling. Classes are designed to promote growth and awareness, and writing things down makes it more likely you’ll remember what you’ve learned…even if you never look at it again! What should I wear around town at night and during the day? People who want to see and be seen go to Mykonos or Santorini, not Lipsi. During the evening, people dress for comfort rather than to impress. A casual skirt or slacks for women is perfect; most men wear long pants. Daytime dress is more casual but keep it modest. Cover up with a wrap if you go into town. Shorts are fine during the day for both women and men. Is there anything I SHOULDN'T bring? You are limited only by your baggage allowances, but the less you bring, the less expensive and cumbersome travel will be. I know it's hard to believe, but YOU DO NOT NEED A LOT OF CLOTHES. If you bring two yoga outfits, two dinner outfits, two bathing suits, and some play clothes for hiking and sightseeing, you'll be fine. There's a washing machine at the villa, and the best dryer in the world is right outside and completely free--the Greek sun! Think twice about bringing styling products like a blow dryer or curling or straightening irons. They use a lot of current, are subject to blowouts (Greece is 220V, not 110V, and even with converters, small appliances often overload), and reinforce the notion of struggle--the struggle to get hair to conform in spite of high winds, salt water, and heat--that we are working on leaving behind. If you know you will be absolutely miserable without doing your hair every day, then by all means, bring your equipment. But if you can live a week without it, you'll be lighter in more ways than one! And naturally, don't bring any illegal or controlled substances. Taking them across international borders is just dumb. What do I need to know about staying on Lipsi? What surprised me most about Greece is general is the toilet paper protocol. The sewer systems are old and fragile, and toilet paper is NEVER flushed, even in big cities. On tiny islands like Lipsi, this is even more important. Conserving water is also important. Please consider showering like Lipsians, do--turning the water off while lathering up and washing, and then rinsing off when you are done. The tap water is not potable, but we will have plenty of bottled water on hand to keep you properly hydrated. You'll see solar panels and windmills on the island. Electricity is expensive, and people consume it only as necessary. If you think of it more as a luxury instead of something that is infinite, you'll realize how little you actually need. Watching the ocean and listening to the goat bells is much nicer than surfing the web once you've gotten used to it. We will have a lighter version of the traditional Greek diet available at the villa during the day: fresh fruit, cheese, yogurt, nuts, coffee and tea, and some salads and traditional dishes like spinach pie. If you enjoy eggs for breakfast or lunch, let us know and Lipsi's chickens will happily oblige. The dozen or so restaurants in town all serve lots of seafood and lamb dishes, mezze (small plates of appetizers meant to be shared), and usually include a very sweet complimentary dessert at the end of the meal. If you have any eating restrictions or limitations, please let us know so we can accommodate you as comfortably as possible. Lipsi is an easy place to be a vegetarian, but a challenging one if you are a vegan. Gluten-free options are not widely available. What if I don't want to do all or any of the classes or activities? Think of this as a vacation where there's yoga. Do what you want--everything is optional. Everyone has his or her own path, and we encourage people to respect their own needs while staying open to the possibility of change and growth. Will I be able to visit other islands during our downtime during the retreat? While it's tempting to try to pack sightseeing in, especially when travelling from so far away, the logistics of visiting other islands, especially for just an afternoon, are challenging. You'll be at the mercy of ferry schedules and will have to allocate an entire day just to go elsewhere. If you want to see a beautiful beach, spend the afternoon at a quiet taverna, or explore, we encourage you to do this on Lipsi itself. The diversity of the island's topography is remarkable, and there are more than enough local diversions to keep you busy for a week. You WILL have the opportunity to visit five neighboring islands on the day we take our cruise. And if your schedule allows, we highly encourage tacking some time to either the beginning or the end of your trip to see Rhodes, Santorini, Crete, or even Athens. To take advantage of our private transfer to Villa M, you'll need to arrive in Leros by 4:00 on September 9. The most efficient way to do this is by arriving in Athens as early in the day as possible so you can catch the 3:00 pm Olympic Airways flight to Leros. Fly nonstop from North America on September 8 to ensure an early arrival; flights that connect through European hubs usually will not arrive in Athens early enough to get to Leros on the same day. There are nonstop flights from Montreal, Toronto, Philadelphia, and Newark. If you must transfer in Europe, plan to leave a day earlier. When you arrive in Athens, you have the option of staying there for the night (the airport Sofitel is easiest) or continuing on to Kos or Rhodes. From there, check the ferry schedule to make sure you'll be able to get to Lipsi or Leros easily. The Sunday ferry visits both Lipsi and Leros. Remember that if you're meeting us in Leros, you'll need to take a taxi from the port to the airport (15 euros). Flights depart from Athens to North America relatively early in the day, which means you'll need to spend the night in Athens. Schedule the afternoon flight from Leros to Athens on September 16 (unless you want to continue elsewhere via ferry, which is a wonderful idea!). The airport Sofitel is literally a five minute walk from the departure gate, and what it lacks in charm, it makes up in comfort and convenience. The soundproofing is phenomenal, and you won't have to worry about traffic or finding a cab the next day. From there, you can fly home on September 17.